Raigrod, Poland. Monument at edge of Jewish cemetery. Chen Winkler, designer, 2014. Photo courtesy FODZ. A few days ago I reported on the new monument erected at the Jewish cemetery of Serock, Poland. Today, (September 18th) another monument will be dedicated in Poland – this time in the small town of Rajgród in the northeastern part of Poland between Grajewo and Suwalki. 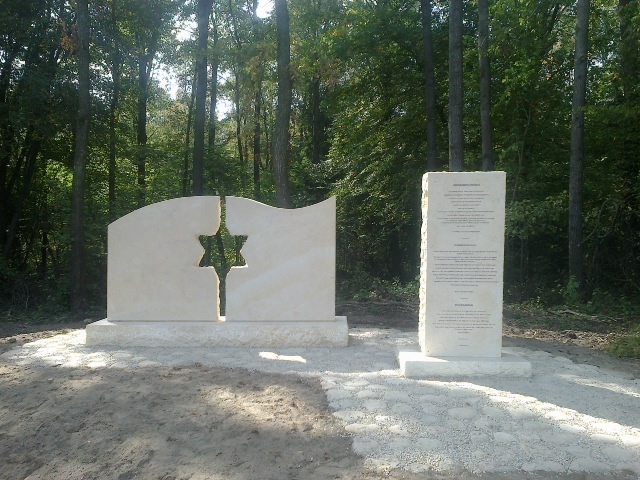 The new monument is built on the edge of the old Jewish cemetery, now completely covered with forest. Like all the erection of many of these individually inspired projects the project took several years to organize and finance. Descendants of jews of the town, including Avi Tzur from Israel who initiated the project, visited and first discussed a memorial in 2011. Unlike many Jewish cemeteries in Poland, this was not owned by the local municipality, but rather by the Forest Authority based in Warsaw. A Jewish community existed in Rajgród from the 16th century until World War II. In 1857 the Jewish population was 1,569, or 90% of the population. In July 1941 the Germans established a ghetto for all local Jews. During this period approximately 100 Jews were murdered in Rajgród. The ghetto was liquidated in 1942, the remaining Jews were sent first to Grajewo, than to the Bogusz transit camp and then later to their deaths at Treblinka. There were no survivors. Winkler is a prominent sculptor and maker of monuments in Israel, especially for the Ministry of Defense. He mostly uses natural materials found in Israel and employs a variety of forms in his work. These include the pierced or cut-out stone, sometimes with the Jewish star, seen in the Rajgród monument. On Israeli military monuments these stars can be seen as Zionist and patriotic symbols. At Rajgród the star is more broadly emblematic of the Jewish people; the population buried here, and those victims who had no proper cemetery burial at all. On the new Rajgród monument the Star of David is intersected by a break in the matzevah-like upright stone slab. The break in the stone, now an accepted Holocaust monument motif, represents a break in a life (like the earlier symbol of the cut-down tree), but also a break in the community, and even a break in history. This device was probably first used to great effect in the Jewish cemetery monument in Kazimierz Dolny, south of Warsaw. This type of break is used effectively in Warsaw at the Umschlagplatz Memorial, where the break give view to a living growing tree – a bit of optimism about the possibility of renewal after destruction – perhaps for a people, it not for the individual. Warsaw, Poland. Umschlagplatz Monument. Hanna Szmalenberg and Wladyslaw Klamerus, designers, 1988. Photo: Samuel D. Gruber (2008). The Rajgród monument allows the viewer to look through, too, but more into the dense forest that now covers the cemetery. It is window to the past, but not perhaps not so optimistic about the future, or at least the future of the Jews in Poland. And indeed, no jews live in Rajgród anymore, and few Jews live in this part of the country. I am also reminded in the form and the isolation of the monument of a memorial on the site of the Concentration Camp in Ereda, Estonia. There the Soviet-era designers could not use the Star of David as a symbol, so instead incorporated and pierced two towers, suggestive of the Tablets of the Law, into the design. According to Monika Krawczyk, CEO pf FODZ, “The travel by sea and importing it to Poland, required enormous effort connected with taxes and customs – where we had to prove that the monument is an artistic object to be located in the war cemetery – that way it could have been exempted from VAT and customs duty”. There are many monuments scattered through the forests of Poland, commemorated events and graves from World War II. Europe, Jewish artists re-invented Jewish art. They produced a body of work based on the Hebrew Bible, synagogue life, and the Jewish world in which they were raised. By the end of the 19th century, academically trained artists were also addressing Jewish social and political themes in their art as well as religious traditions. This lecture introduces the work of many often forgotten artists such as Moritz Daniel Oppenheim, Solomon Alexander Hart, Alphonse Levy, Edouard Brandon, Simeon Salomon and many others. In the independent studios of the early 20th century many of these trends continued, though styles and subjects changed. Many Jewish artists actively engaged in and promoted new art styles including impressionism, Art Nouveau, cubism, fauvism, expressionism and constructivism – sometimes distancing themselves from all things Jewish, and sometimes building on Jewish themes. Well known Jewish Impressionists and Modernists included Camille Pissarro, Jozef Israëls, Max Libermann, Marc Chagall, and Amadeo Modigliani. Most of these Jewish painters- with the exception of Chagall – only occasional referenced Judaism in their art, though collectively they influenced how 20th century Jews viewed, understood and collected art. Karen Kaplan from the United States also helped raise funds for the project. She recently published a memoir Descendants of Rajgród: Learning to Forgive about her father’s escape and survival during the Holocaust and about how he and she coped with the legacy of destruction. Congratulations to all who worked on this project, and our thoughts are with you and with all the perished Jews of Rajgród.